Construction at Greenway Parcel 9 has commenced for the Haymarket Square hotel proposal with the area being cleared and cordoned off by Suffolk Construction. The space is a vacant triangular parcel adjacent to Haymarket that came out of the Big Dig on property owned by the State’s Mass. Department of Transportation (MassDoT). A 6-story, 225-key hotel with a 1-story market hall will be located along a renovated Blackstone Street and the Rose Kennedy Greenway. The hotel flag is yet to be determined, but expected to be mid-priced brand. No on-site parking is planned. The hotel will use valet service to area garages. The project was approved by the Boston Redevelopment Authority (BRA) Board of Directors in June of 2016 after a multi-year bid and review process. In 2017, designated developer Normandy Haymarket Investment Group, requested and was granted by MassDOT a Transfer of Interest in the project to Haymarket Hotel, LLC c/o Olshan Properties of New York. 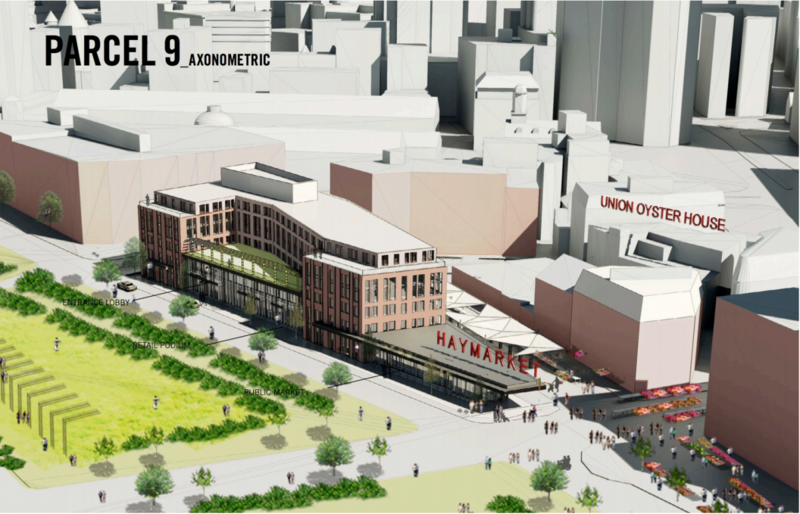 As part of a Planned Development Area reviewed by the Boston Redevelopment Authority, the market hall pavilion is expected to bring the “third leg” of the emerging “Market District” centered around the longstanding Haymarket Pushcarts and new Boston Public Market. The project’s architect is Perkins + Will. In response to community feedback and height concerns from the Mass. Historical Commission, the developer lowered the highest section of the building from 103 feet to 65 feet in the latest plan. The first floor market hall was also reduced in height extending out toward the North End Greenway parks along Haymarket. Does anyone know if the final plan includes NOT closing off Hanover St. between Surface Rd. and Congress St. every Friday and Saturday? I know it’s tradition and has been going on for decades, but it seems unnecessary and highly inconvenient for drivers. 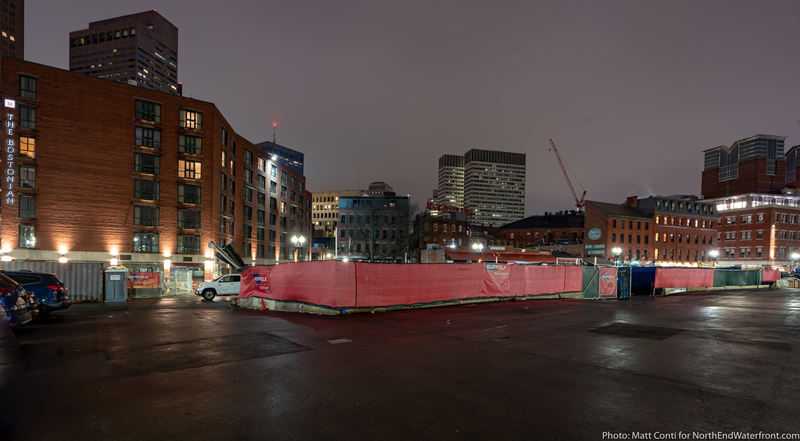 The delayed Harbor Garage project is the true disgrace on the Greenway.